It was exactly 77 years ago, when family Green - now a line of mill builders - started to produce Good Mills - Green's flour mills with craftsmanship passed on by every generation. The magic of our flour mills comes from the beauty of our nature, mastercraft of our people and the need of wholesome way of living in harmony with our country. Question: What does it mean - Healthy flour? - Businessmen - millers, because they need to supplement the flour market with flour types which the huge flour mills cannot offer and right these shortage types are the best and healthy. 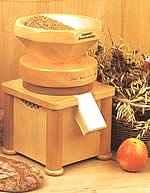 These millers supply the fresh flour to the small bakeries. - healthfully living people, who buys and use the products of the company Green for their own needs and for the needs of their families, because they have realized they could do more this way for their health than to buy any synthetically fortified products from big-malls or from any drugstore. then you`ve come to the right address. Now there are stone-mills from the company Green working all over the world – from Australia through North or South America to Japan, Korea, Africa and – naturally – in Austria, Germany, France, Swiss, Italy etc. - up to 200 - 1000 pounds/hour – these are very special slow-turning stone mills with so called cold milling – because of retaining of all valuable components from the corn in the flour. We have something to offer even for the difficult task – to achieve the flour sweet-smelling and full of vitamins, but still as white as possible. For these targets we have several different types of milling stones according the intention.